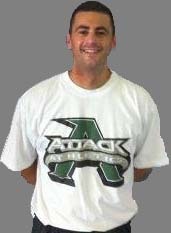 I have spent three summers working at Attack Athletics with the renowned Tim Grover and current Dallas Mavericks player development coach Mike Procopio. I worked with many NBA players during those years. I also spent a lot of time working with foreign pros. I spent a lot of time with Detroit Pistons guard Will Bynum. I created defensive and offensive player development plans for him. We watched hours and hours of video to find ways to improve his game. I also suggested that he begin to make some adjustments to his shot. Watching hours of video I saw some adjustments he could make to improve his shot. This past year his 3 point shot percentage was 32% compared to career percentage of 27% I believed in Will & he believed in me, and I still feel the best is yet to come for Will. I spent three years working former Syracuse Orange star Brandon Triche. When I started working with him, nobody believed he could play pro basketball. Three years later he become a star in the Final Four and is currently playing professional ball in Italy. We are halfway to achieving our goal of him playing in the NBA. We will be working and improving his game during his off-season. I believe he can follow the same path as Will Bynum who played overseas for two years before signing with the Pistons. I am able to do similar things with current college players with the potential to be drafted or play overseas. I will prepare you for the college game but also start developing you to play professionally. I have worked with a number of elite high school players while working at Attack in Chicago, some of them are now playing in the NBA. I have also worked with a number of elite players in Rochester to help them achieve the division one level. Just to name a couple of players: Javon McCrea, currently at the University of Buffalo; Mandell Thomas currently at Fordham University. I have also worked with a number of great high school players who are currently playing division three college basketball. Phillip Pellegrino who is playing at Alfred University and Ben Bobo who is currently playing at St. John Fisher College.